Warehouse Catwalk Systems – What are they and how can they be used? Specialty warehouse equipment including conveying systems and sorters are essential to a smooth running warehouse operation. They are instrumental in providing organized and proper flow of product from point A to point B in the warehouse facility. These important systems require a strategic and routine maintenance plan to ensure proper operation and safety specifications. In order to service these systems properly, you need to be able to access them without interrupting the flow of product, because downtime costs money and effects your overall bottom line. 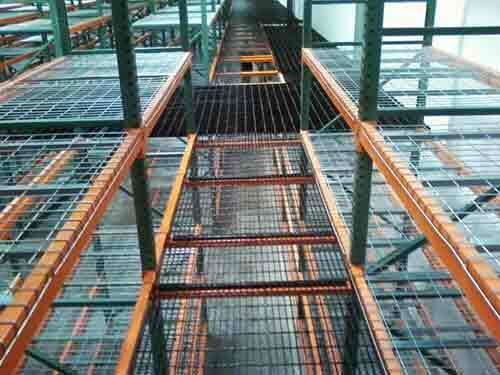 One of the best ways to provide access to these systems is by using whats known as warehouse catwalk systems. Catwalks provide a means to access conveyor systems and warehouse racking, and industrial shelving units without the bother of an interruption in flow of products within the facility. This means that your logistics involving product flow does not sustain any significant downtime when maintenance or repair is required, and your movement of goods remains consistent. How Are Warehouse Catwalk Systems Installed? Catwalk systems can be self supported and also suspended from a structure like a ceiling. Their modular construction creates and easy way to access in tight or hard to reach spaces, and are ideal for connecting one structure to another. Different accessories can be used and designed to meet and exceed OSHA standards for safety and compliance to ensure a proper warehouse setup. For example, under the Americans with Disabilities Act, catwalks systems can maintain compliance by using special railings that fit with the overall structure in order to give workers full-safety and access when using the specialized equipment. Culver Equipment, LLC is a leading warehouse industry provider of material handling equipment that specializes in the sale, installation, planning, and use of warehouse catwalk systems within large-scale facilities. With over 20 years of experience in providing warehouse design solutions, we have the professional knowledge to help you implement catwalk systems with maximum efficiency. Contact us for more information or to speak with one of our sales professionals about your need for warehouse catwalk systems, and check out our current available inventory.